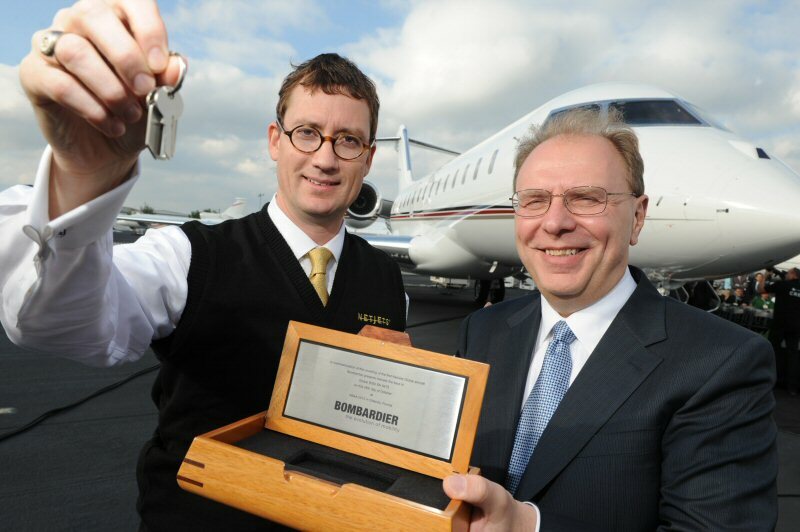 ORLANDO, FLORIDA--(Marketwire - Oct. 28, 2012) - Bombardier and NetJets®, today introduced NetJets' first Global 6000 jet at a special unveiling event at Orlando Executive Airport. The aircraft will be featured as part of the static display for NBAA 2012 before being officially handed over to NetJets in the fourth quarter of 2012. "We pride ourselves on crafting perfection, and our Global family of jets are best in class," said Steve Ridolfi, President, Bombardier Business Aircraft. "We know that this aircraft will impress NetJets' customers and we are proud that today we are able to introduce this magnificent jet to the world." Jordan Hansell, NetJets Chairman and CEO said: "We listened to our customers when we began looking at aircraft to add to our fleet. The Bombardier Global 6000 jet embodies the characteristics they were looking for - state-of-the-art, customized features and the finest craftsmanship. The NetJets Signature Series Global 6000 aircraft will be an excellent addition to the NetJets worldwide fleet, which is part of our plan to add up to 670 new products with a total value of $17.6 billion over the next decade, and will open up new and better travel opportunities for our customers. We are proud to have worked with Bombardier to create this world-class aircraft." NetJets' Signature Series™ Global 6000 jet is equipped with state-of-the-art avionics and perfectly balances comfort, speed and range. The aircraft features a full-service galley located in the forward section creating a private and peaceful cabin environment for up to 13 passengers as well as a crew rest area that allows for extended flight segments. The spacious, sophisticated and extremely quiet cabin features a private stateroom that is conducive to productivity and relaxation. Additionally, the aircraft features light coloured leather and ostrich embossed leather upholstery which is complemented with African Sapele wood surfaces and a brushed steel metallic trim. On March 1 2011, NetJets placed a firm order for 50 Global business jets with options for an additional 70 Global aircraft. The transaction for the firm order is valued at up to $2.8 billion US based on list prices. The firm order includes 30 Global 5000 and Global 6000 aircraft, with final deliveries scheduled to begin in the fourth quarter of 2012. The sale includes 20 firm orders for Bombardier's newly launched Global 7000 and Global 8000 jets. Deliveries of these aircraft will begin in 2017. At a total retail price exceeding $6.7 billion US, NetJets' order is the second largest aircraft purchase agreement in the history of private aviation, second only to NetJets' unprecedented aircraft order in June of 2012 which included firm orders and options for upto 275 Challenger jets from Bombardier with a potential value of $9.6 billion US. Global 6000 aircraft: The Global 6000 jet's unrivalled cabin size and levels of comfort combined with a stand-up shower* and the Bombardier Vision Flight Deck means no other purpose built business jet comes close in terms of high-speed range capability and traveller comfort. Offering the ultimate in technology, this intrepid jet can link Miami with Tahiti or Cairo non-stop, with eight passengers and three to four crew**. NetJets Signature Series™ aircraft: NetJets recently introduced the NetJets Signature Series™ of aircraft, which are new aircraft that will be entering the NetJets fleet that are customized from design through production and include advanced cockpit and cabin technologies to ensure maximum safety, reliability and operating efficiency as well as advanced in-flight entertainment systems and custom cabin designs. The NetJets Signature Series™ of aircraft, among others, include the Bombardier Global jet family and the Challenger 300 and Challenger 605 Series jets. Bombardier, Challenger, Challenger 300, Challenger 605, Global, Global 5000, Global 6000, Global 7000, Global 8000,The Evolution of Mobility, and Bombardier Vision are trademarks of Bombardier Inc. or its subsidiaries. Jordan Hansell, NetJets Chairman and CEO and Steve Ridolfi, President, Bombardier Business Aircraft. Orlando, Florida, October 28 2012.